Aquaman 2 is one step closer to reality, as the movie has been given an official release date by Warner Bros. The studio has been understandably eager to get the ball rolling on the sequel, as the first movie has overperformed dramatically and has given the DC brand the shot in the arm it needed. While there are still many questions we have when it comes to what we're going to see when the sequel arrives, we now know it's going to surface in winter 2022. 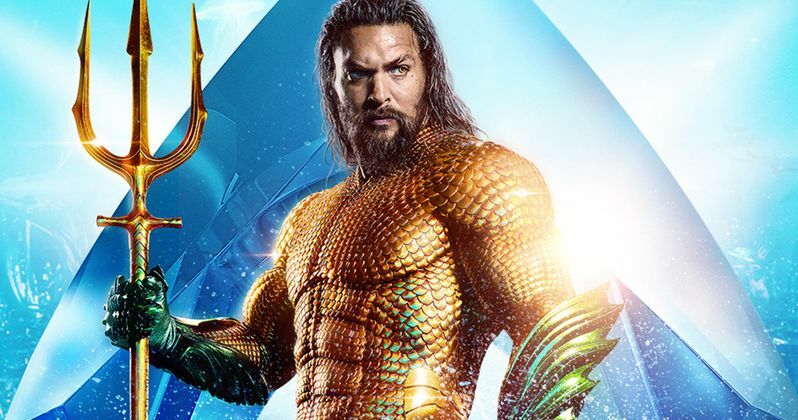 According to a new report, Aquaman 2 will arrive on December 16, 2022. This date is highly logical for a few reasons. For one, that puts it out at roughly the same time of year the first movie debuted, as Aquaman was released on December 21 of last year. That worked out quite well and they will surely want to try and replicate that success. It also ensures that the creative team has plenty of time to put the movie together and that they won't be rushed to meet a release date. Recently, it was revealed that David Leslie Johnson-McGoldrick, who helped pen the first movie, has been brought back to write the sequel. We also know that James Wan, who directed Aquaman, will at least produce the follow-up, alongside Peter Safran, another important cog in the creative team. However, there is no indication currently as to whether or not Wan will return to the director's chair for the sequel. Warner Bros. would undoubtedly like that to be the case, but he's also probably got plenty of other offers on the table and will need to decide if he wants to spend another three years deeply entrenched in Atlantis. Following the release of Justice League, DC Films began to restructure itself behind the scenes and completely shifted focus for the future. Aquaman happened to be the first movie released following Justice League and that put a tremendous amount of pressure on it to deliver. While not exactly a critical darling, it wasn't bashed by critics like Suicide Squad was and went on to find huge success at the box office. To date, it's brought in $1.13 billion globally, making it the 20th highest-grossing movie of all time. Not bad for a movie based on a character that was subject to a great deal of ridicule in years past. Jason Momoa will return as Arthur Curry and Amber Heard will be back as Mera. Given what happened in the post-credit scene, it's highly expected that Yahya Abdul-Mateen II will return as Black Manta as well. In addition to Aquaman 2, Warner Bros. is also working on a horror-themed spin-off titled The Trench, which will focus on the characters of the same name that were introduced in the first movie. We'll be sure to keep you posted as more details on the project are made available. This was previously reported by Variety.